I hope the organizers collected info on who most of the people were and how they found out about it - much lower percentage of my seedling customers, many many new faces. Who were all those people? Simple -- they were there to see the area's tomato celebrity! Amazing what a little TV coverage can do. It sounds like a fantastic, well planned event. I know if I lived in the area I wouldn't have missed it! Here's a question stemming from Farmer's Daughters post..
How do you guys get the word out? Flyers? Local papers? Web? the link once you get to the main page you then have to click on each picture. 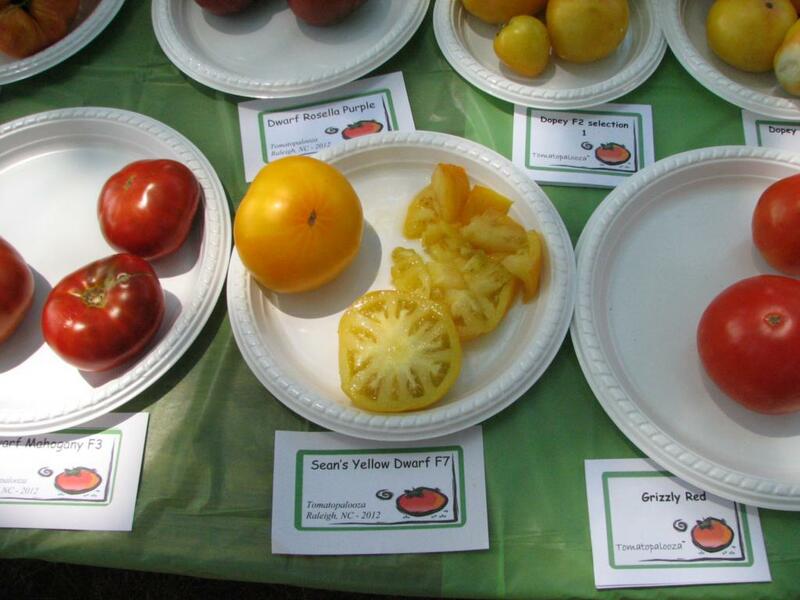 Jan Understood,did so,got the maters but got image size of maters only,no variety placard as in thumbnail view. Dwarf Caitydid - gorgeous fruit, really tasty - this was grown from seed Michael sent me and it the latest generation (as is what Ray is growing) - very promising as a nice large bicolor release from the Pesty line. Striped Tidy and Fred's Tie Dye - people loved the color and the flavor of both. Dwarf Blazing Beauty 3434, 3435, 11-40, 3410 - nice to be able to taste them all side by side. Slightly varying shades of orange, with 11-40 the darkest color. All of them exhibited intense flavor and distinct tartness - this will be another really good one to focus on to be sure it is released as soon as possible - a large potato leaf orange with sparkle! Uluru Ochre 3481, 11-147, 3460 - all showed the distinct color, none showed the intensity of flavor that we got last year - could just be that it doesn't like the extreme heat. 11-147 probably the lead selection. Boronia 3463 - too bad this was the only representative - but showed well. Loxton Lad and Loxton Lass - I think that we have some great Loxton Lass samples that should be the lead selection - will be a very well liked medium large regular leaf orange. Nice potential here! Summertime Gold 2512, 08-145, 11-181, Lee's sample - I am so happy we have good leads for reselection - the 08-145 and 11-181 are pretty much identical and what we are aiming for - looked and tasted great. Lee's sample, oddly, wasn't quite right - probably a bit of remaining segregation- a bit too round, firm, and different interior. With its advanced generation, 11-181 is the one to work up for seed and re-release. Sweet Scarlet Dwarf 3412 - this is the best red I've tasted yet from the project (not surprised - Tipsy as a line is just loaded). Plus incredible interior color - deep crimson with green gel-surrounded seeds. And this isn't even as good as the 11-43 that I grew, but didn't have a fruit to bring. We have a good lead - and I suspect other NHers have great leads as well. Dopey F2 selections 1, 2, 3, 4 - I went back to seeds from the F1 - the heart shaped one that a volunteer found - and grew four dwarfs, 1, 2, and 3, were round to oblate yellow/red bicolors, 4 is nearly white - alas, none of them tasted very good. We were lucky to find Dwarf Russian Swirl - otherwise, I think we can put this line to bed. Ivalde F1 and F2 selections 2, 4, and the F1 - we have fruit that tend to go heart shaped, and thus far have pink and yellow/pink bicolors. Flavors are good - the Ivalde line is well worth pursuing - I have a fruit from selection 1 at home that is 1.5 lbs, pink heart shaped, and potato leaf, but not ready to taste yet. Wherokowhai 3505, 3437 - Outstanding results - medium large, smooth bicolors, hard to select between these two - another very high priority to get on the market as a potato leaf bicolor. 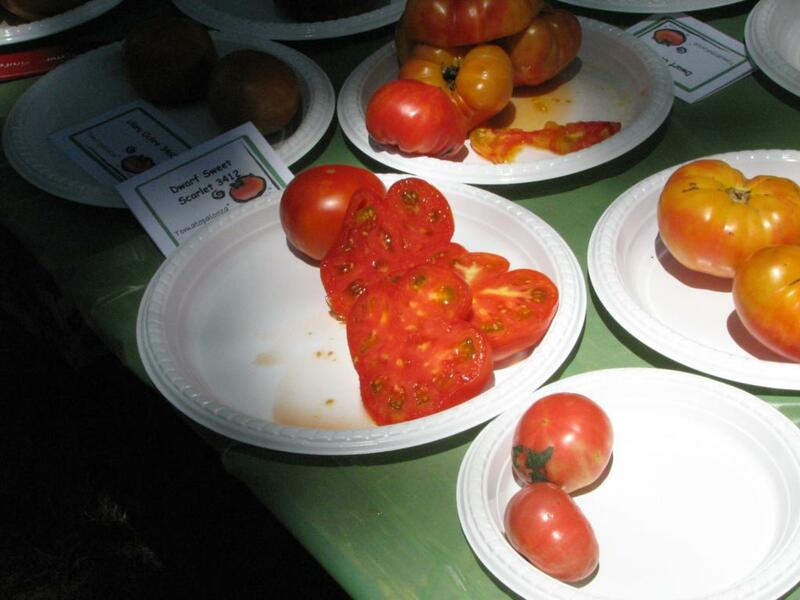 Bendigo Blush - grew as a pink nippled oval cherry tomato and people liked it. Needs work on color selection/stabilization, but we should get some nice cherries out of this. Dwarf Jade Beauty, Dwarf Beryl Beauty, Dwarf Kelly Green - The first two are released and people loved them - Kelly Green will be released this fall and people loved it. Dwarf Sweet Sue - two perfect specimens brought and tasted and it was very well received - due for release this fall. Summer Sunrise - another that people really loved - and due for release this fall. I brought many other Dwarfs, as did Lee - I will let Lee describe how his tasted - the only two I tried were Sean's Yellow Dwarf, which is really good, and one of the Brawny's - also really good. All in all a very nice day. We had over 190 people sign in, which I believe is the largest number we've ever had attending. 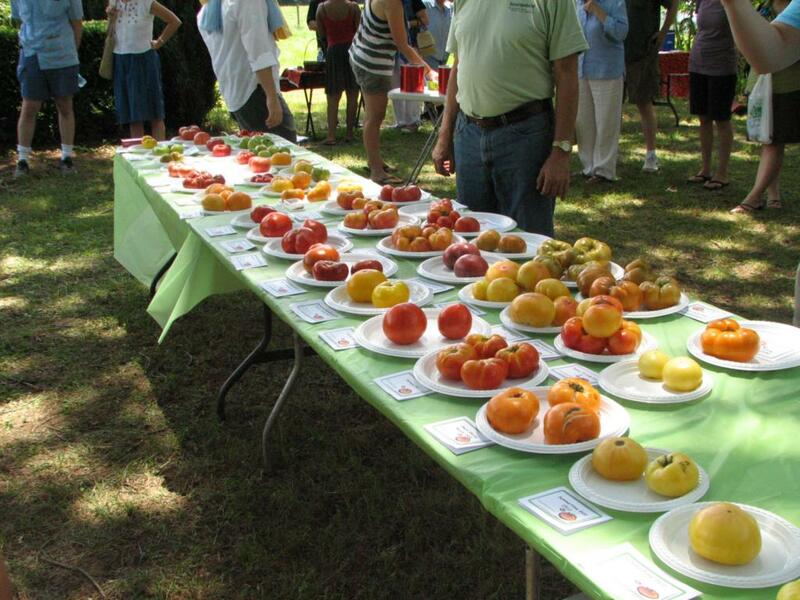 We had 160 different tomato varieties represented. Of course, I forgot to vote which is why Cuostralee isn't in that list! We had 4~5 tables that held the red/pink varieties and 4 for the cherries, greens, blacks, orange, yellow, whites, and bi-colors. We had 3 tables for the dwarves. Speaking of which, Loxtan Lad, Dwarf Blazing Beauty, and Wherokowhai were all quite remarkable for their amazing burst of flavor. These were from the dwarf table. Summertime Gold - All were a little off this year. Still an 8, but I suspect the weather around Raleigh subdued the flavors a bit. very soon. This one is in process for southern hemisphere seed production, and may be commercially available there before the NHer's have it! in business as many folks really liked the flavor of this one. My dad (again) has grown the best of the lot, and I will move forward with his. Brawny F3 - The size/shape and color of this one is as expected. However, the fruit from my dad's garden has a much better taste. Many folks really liked the flavor and texture of this one, so I will move forward with this version. Didn't get to compare it to Sweet Scarlet Dwarf, but I think the size/flavor potential of this one (future Dwarf Cuostralee!) keep it in a class of it's own. All in all it was a very pleasant day.... but I had to come back to work to recover from the weekend! Thanks Lee....quite a day. I am still pretty much brain dead today. Can't even ponder walking into the garden! Lee, Shannons, a paste as listed by Tania's???? Tied for top taste? I want some!!!!!!!!!! Are they really that good? PM me Kenny if you'd like some seeds!